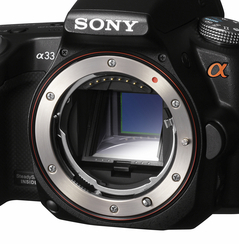 Today was the official press announcement of several new and exciting Sony Alpha cameras and lenses. 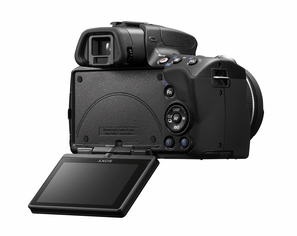 The list of new bodies is as follows: DSLR-A580, DSLR-A560, SLT-A55, SLT-A33. 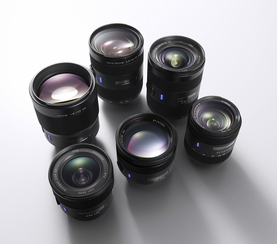 In terms of new lenses: Carl Zeiss® Distagon T* 24mm F2 ZA SSM (model SAL24F20Z), a DT 35mm F1.8 SAM (model SAL35F18) and an 85mm F2.8 SAM (model SAL85F28). With the introduction of the new A33 and A55 comes new technology and terms that will require a brief explanation. These two new cameras use what Sony is calling Translucent Mirror Technology™ which basically means that unlike traditional DSLR cameras where the reflex mirror moves out of the way during exposure, the SLT (Single Lens Translucent) cameras mirror is fixed and light passes through it during exposure. This will allow for fast, accurate autofocus during video shooting. Read on for a summary on the individual cameras and lenses. 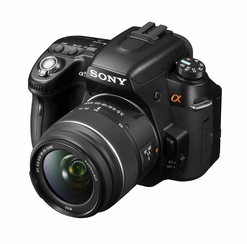 Featuring a 16.2MP APS-C sized EXMOR HD CMOS Sensor, the A55 offers up to ISO12800 with a new multi-shot Noise Reduction mode offering ISO 25600. Not only does the camera offer 1080 AVCHD format video, but it offers autofocus that is said to be second to none thus far. When the action picks up you can shoot at 10 framers per second. Quick AF Live View is still available and feeds through to a 3-inch LCD that tilts and flips – a criticism we have had for some time, that with such excellent live view you were limited by the screens movements too often. Also of interest is the built in GPS, normal and 3d Sweep Panorama modes and 15 autofocus points compared to the 9 that was only available previously. Much the same camera as the bigger A55. The main differences are the lack of GPS and a drop in resolution to 14mp. All other things remain equal. 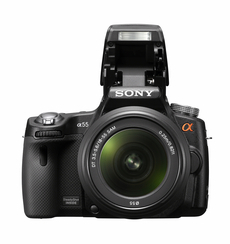 In many ways the A580 is a standard reflex version of the A55. It shares the same sensor and perhaps the best thing to do is share what it lacks rather than what it has when compared to the A55. So where the A55 gives 10fps the A580 give 7fps, does not have the GPS or claim the autofocus in video. One more, much the same camera as the A580 with the only real difference being that the A560 has the 14mp sensor found in the A33. The Carl Zeiss® Distagon T* 24mm F2 ZA SSM has been a long time coming and rounds off quite nicely the range of Zeiss lenses available for Sony. Cant wait to get our hands on this. This new DT 35mm f/1.8 SAM lens is aimed squarely at the cameras with APS-C sized senors as a replacement for the old faithful 50mm on a full frame camera. Should the price be right it would be a good to have in almost any camera bag. Now this is an interesting announcement, an 85mm f/2.8 SAM lens, the lack of the DT means it will work full frame and make for an affordable mid portrait lens, particularly next to the only other 85mm being the Zeiss f/1.4 offering. It will be interesting to see how this lens performs optically.